A souvenir of the Ramakrishna movement that happened in India in the 18th century, the Ramakrishna Temple is a monastic organisation for men. It is an initiative of the Indian mystic and yogi Ramakrishna, who is believed to have bestowed with spiritual ecstasies from a young age. With a motto of “For one's own salvation, and for the welfare of the world” you will witness some of the most humble acts of humanity here. The institution teaches how to achieve multidimensional excellence by adopting a healthy, holistic and cultured lifestyle. How popular is Ramakrishna Temple? Sri Ramakrishna Math is right on main road with very good parking space. 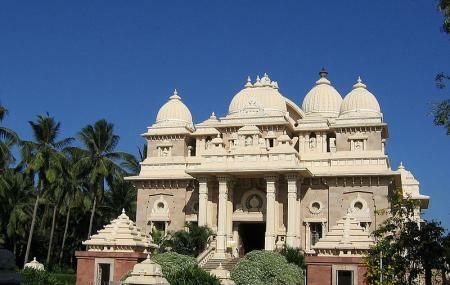 The architecture of this place is very spiritual in nature and meditative mind easily sets in. Beautiful gardens. A big book store is operated. This a a universal temple and anybody visiting here can feel the universal brotherhood. Facilities are good and place is very clean and well maintatined. Beautiful book stores with wide variety of spiritual and motivational books. Great collection of books suitable for all ages especially very useful for kids and students like activity books, drawing books and skill development books,motivational books and personality development books for youth. Its a paradise for book lovers. Very reasonable prices. Once in a year they run discount sale also. Not tobe missed, must visit place. Wonderful Place. Silence is divine there. Evening 6:30 bhajans are mesmerizing. Book store is a treasure. The main temple is a big beautiful piece of architecture in white marble.The wide foot-steps which take us to the main entrance of the temple whose architecture is a confluence of Jainism, Buddhism and Dravidian style. The four high pillars columns are 60 feet in height giving a feel of the Roman architectural style. The old temple dedicated to Sri Ramkrishna and Sarada Ma, is also a great place for quiet contemplation. The Lawn looks more influenced by the Mughal style with a colourful pathway decorated with parapets. An oasis in the middle of a busy city. How to reach there? Nearest Bus stand: Sanskrit College, Mylapore & Luz corner bus-stand. Nearest Train stations: Thirumayilai (also called Mylapore) & MundaKanni Amman Kovil. These stations are located on Velachery-Chennai beach local train route. Visiting timings: (No Entry fee) 05:00-11:45 & 15:00-21:00.